However, a close reading of the act, rules and the twitter clarifications, suggests that there would be cases, where RCM u/s 9 (4) would lead to double collection of GST on a chain of sale of same item in certain cases. Consider this scenario: A Temple has rental income exceeding Rs. 20 lakhs / annum and only because of this reason it is registered under GST. To a question, whether the purchases made for regular temple activities would also attract RCM u/s 9 (4), the commonsense answer should be NO, as the purchases for temple activities were not made in the course of the business. However, surprisingly the CBEC’s answer on twitter is contrary to the above commonsense answer. The twitter screen shot of CBEC’s answer is reproduced below. To appreciate the position taken by CBEC let us read the wordings of section 9 (4) more closely. supplier, who is not registered, to a registered person shall be paid by such person on reverse charge basis as the recipient and all the provisions of this Act shall apply to such recipient as if he is the person liable for paying the tax in relation to the supply of such goods or services or both. The above section talks about purchases by a registered person, and does not qualify with the words, “for the purpose of business“or with the words “towards the taxable outward supplies”. Also note that the temple has both rental income, and religious activities and both these activities are carried out under the same PAN number. Hence, according to the very strict interpretation of the wordings of the section9 (4) as it exists today, the purchases made for the temple / charitable activities, by a person registered under GST would be subject to RCM provisions under section 9 (4) of the CGST Act. Since the temple / charitable activities, are not carried out in the course of business and their final output is not subject to GST output liability, the GST paid under RCM would not be available for any set- off and hence would become a cost to the temple / NGO. 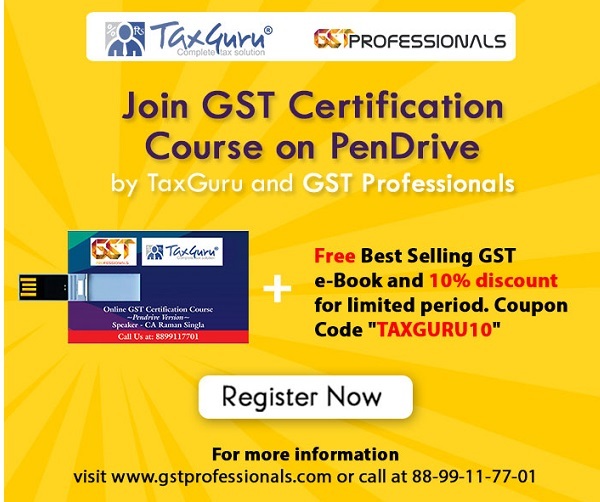 This strict interpretation would lead to an anomalous situation, where the GST is collected twice on the same item, i.e once when the unregistered supplier, purchases the goods from a registered dealer and again when the GST is paid on RCM by Temple / NGO registered under GST only because of rental income. Apparent injustice to NGOs in the form of collection of double tax on the same item at the end of the supply chain. The above example, clearly shows that insisting on the registered persons for the payment of RCM on purchases made for activities, which does not have any final output liability, results in collection of GST twice on the same item during its chain of sale till ultimate consumption. This is patently, unjustifiable and discriminatory for such assesses who have both taxable and non taxable ( or exempt ) activities carried out under the same PAN number, and goes against the fundamental principle of equality before the law guaranteed by Article 14 of the Indian Constitution. This goes against the cardinal principle of GST that tax on tax be eliminated. It is interesting to note that while collecting the tax revenue through RCM route, the law does not distinguish between the purchases made for the purposes of any business with taxable output liability, and the purchases made for other purposes, such a distinction is made for the purpose of granting the benefit of taking input credit. Section 17 (1) and 17 (2) categorically state that the benefit of availing of Input credit, is available only in respect of inputs used for final output which are subject to GST and Zero rated supplies and not for inputs used for non-business purposes and for exempted supplies. Both the sections are quoted below. Section 17 (1): Where the goods or services or both are used by registered person partly for the purpose of any business and partly for other purposes, the amount of credit shall be restricted so much of the input tax as is attributable to the purposes of his business. Section 17(2): Where the goods or services or both are used by the registered person party for effecting taxable supplies including zero rated supplies under this act and under IGST act, and partly for effecting exempted supplies under the said acts, the amount of credit shall be restricted so much of the input tax which is attributable to the said taxable supplies including zero rated supplies. Anyone with common sense can appreciate that if input credit is not allowed for purchases made by a registered person for exempted supplies, on the same logic RCM u/s 9 (4) also should not be collected on the purchases made for exempted supplies and for non- business purposes. From the trade and industry and professional bodies side, one fervently hopes that the RCM provision u/s 9 (4) is removed from the statute forever. If not, One would request the Govt and GST council to atleast appreciate the above anomaly in the GST acts and clearly come out with clarification that RCM u/s 9 (4) would be applicable only in respect of the purchases which are attributable to effecting taxable supplies including ZERO rates supplies. Else the NGOs and Religious trusts having rental income would be made to suffer unjustifiable costs, leading to protracted litigation. Malaysia knows better, they scraped GST itself. Any thing Good for the MNCs and Big Audit firms are definitely not good for the common man. When Governments falls prey to their markting, the small ones will suffer. Provisions of RCM u/s 9(4) should be deleted from the act for ever. Keeping records and accounts for the expenses dealt with registered delear & unregistered dealer is also a big big burden on trader. Also in case of GTA ,registered under GST but no taxable supply ,or partial taxable supply ,what happens to RCM paid u/s 9(4) ,repairs etc ? We r reseller in edible sugar. When we receive any late payment of interest from sundry debtors, then we charge then GST on that interest @5%. Is this system ok ? It is to be noted that registered person also makes non business related purchases for which input cannot be claimed.In that scenario also, there will double payment of gst i.e at the time of purchase from unregistered dealer as well as on rcm basis.